All Sales Billet Smooth License Plate Frame All Sales Billet Smooth License Plate Frame, Billet Smooth License Plate Frame, Smooth License Plate Frame, Billet License Plate Frame, All Sales 84002P License Frame, Chrysler 300 License Plate Frame, Dodge Challenger License Plate Frame, Dodge Charger, [All Sales 84002P License Frame] - $44.95 : 3rd Strike Performance, Your Source for Late Model MOPAR Performance Parts and Accessories! All Sales has been serving the automotive industry since 1994, now renowned for its line of billet eye candy. Nothing makes a stronger statement about the quality of your ride than trick billet accessories. 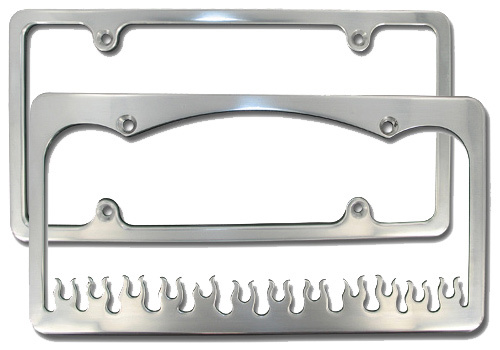 Carved from 6061-T6 aluminum using CNC technology and polished to a brilliant shine, this license plate frame includes mounting hardware for an easy installation. Outfit your vehicle, right down to the last detail. Sport a sharp license plate frame from All Sales and get that extra style you've been looking for.